By early next year the Scania K320UBs will surpass this number. I was on 504 today and for the first time noticed little metallic cylindrical things beside the nearside interior lights (the size of the holed area of the speakers on those lights). Anyone know what they are or might be for? How many things? Just the one at the front and another at the rear? If so, they are the sensors for the former bus stop signal system. 1 behind the front nearside lights and another behind the rear nearside lights, so 2 all up that I could see. 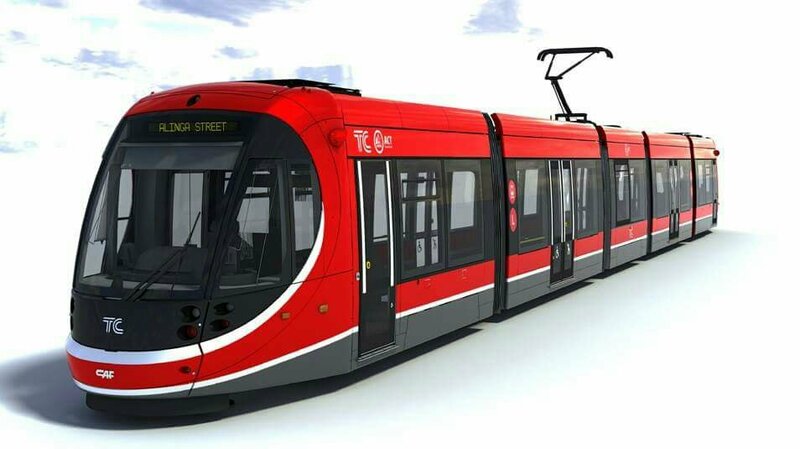 On the earlier question of livery, Canberra Metro recently posted an image of a CAF Urbos in Transport Canberra livery. I would imagine the new bus livery may be similar, but with blue (for Bus) instead of red. I hadn't noticed the cut-outs, but there have been many bus seats that this has happened to I've noticed in the past couple of months. It's always the fold-up seats that have it, and so far from what I've noticed, only on the Iris - E5s. Must be a lack of supplies (im thinking), so they're getting daggy covers from elsewhere to fix them up. So they're not going to be using these ones which were used previously when promoting the project? I think those liveries looked much nicer. AFAIK those seats are only installed in the CB80 artics. They are a Custom bus fold down seat, rather than McConnell which are used in every other Custom bus. With the remaining 6 darts that are being used for the 101 loop, are they owned by ACTION, Transport Canberra, or? I'm wasn't 100% sure about the answer myself, but the driver who asked me today during my travels wanted to know. Cause he thought they were being leased or something - or is that the answer, sold for something/scrap, but still leased by ACTION? If they were sold for scrap, they wouldn't be in service. Unless there have been further withdrawals, the number of active Renaults (PR100.2 &amp; PR100.3) is ... 145. When 618 enters service there will be 80 K320UB 4x2s in service (split 41/39). Currently there are 80 PR100.2s in service - also split 41/39. Question: are there any Scania L94UBs which DON'T have the additional grille on the engine flap? I've not noticed any, just wonder if there are any left to be done. ACTION have responded to the predictable "my bus isn't air conditioned" whingers by stating there will be 30 new buses in service this year. They exceeded that number: 33 new buses entered service this year - 588 to 620; as well as 490 for six months. Not that it did much to stop the whingers. Quote New buses entering the fleet from now on will carry the blue livery with light rail vehicles to feature the red livery. Does this mean that the new artic will also be in the new livery? I had had the assumption that it would be the green one matching the other same artics buses in the fleet. I think at present all buses of the same type have the same liveries as each other. In the TC email alert that I just got, it states:Does this mean that the new artic will also be in the new livery? I had had the assumption that it would be the green one matching the other same artics buses in the fleet. I think at present all buses of the same type have the same liveries as each other. It does imply that, but in fairness it could go either way given there won't be much fuss when the artic arrives I'd think given it is nothing new really. As for all buses of the same type, that depends if exclude AOA's plus whether your count the "Conserve Fossil Fuels" livery as an AOA or a livery. I don't have evidence, but last time something like that happened was with the AEC Swifts in the late 1960s-1970s when the livery changed from coffee and red to yellow fire and blue. Although they may have kept the same livery with the same body - so that doesn't count. UPDATE: The Freighter bodied Swifts may have been the last in the old livery with the Smithfield bodies from 1974 arriving in the new orange/blue scheme. Some of the Freighters were repainted into the new colours. I won't do a face palm meme, i think I'd just prefer to face palm you in person. How about you call it a Bustech Scania, no confusion at all! Does anyone happen to know why the Hanover destos installed in the PR2s, PR3s, 307 and 362 to 373 don't change what they are displaying automatically when they arrive at termination points (and have to be changed manually by the driver)? 368 now has a green front like a few of its sisters. Will the new Bustech and AVASS buses be used on the weekend services? Bustech - no reason why not. AVASS - too soon to know, but possibly not since it will depend on trained drivers and mechanics. It's possible that I didn't look hard enough, and I tried to in the gallery but not all the shots are of the sides, and some are but with the old AOAs. Can someone tell me all the fleet numbers of those random Mk1 P2s that had Mk2 liveries please? It's one thing that's been troubling me for years. Atm I know of (from KoB telling me and from past knowledge): 690, 758, 760, 808, 835 and 840. Were there any others? 690, 758, 760, 808, 835 and 840. Were there any others? You're missing 751, 775, 798, 853, and 869. 758 had the Mk1 livery as Snorlax said. The trickier question is which of those wore both the Mk1 and Mk2 liveries - not all of them did as some were delivered in AOA and then repainted into Mk2. Also, as it just become something I need too, (and half the relevant gallery photos are black and white), which of the O.305s had the opposed livery. I can see a few, but I can't be sure of all of them. Also, that springs a question to mind. What was the or was there a reason for the livery change in the 90's with the SLs/SGs and Mercedes buses around the time of the Renaults being brought in? It's somewhat odd to me, as when the new buses now days with the Iris coming along, shortly after only a few P2s were given a temporary stickers, but nothing else was given a big change like what happened back then. As for which Mercs had a modified livery, I can't recall those off the top of my head. You could try searching the wiki for "trial livery" and "experimental livery" though. Adding such a category to the Wiki may be something to put on our to-do list. I've been doing a little bit of research just now on the PR3s. I just wanted to confirm, the 'a' on the end of any of them meant them as being wheelchair accessible buses (or/and trial/experimental) is that correct? Other than those features they were pretty much the same bus? The .3a buses were high floor 100.3s with a wheelchair ramp and sloped entry floor plus wheelchair bays. BUS-113 was a prototype and the rest were production vehicles (113 was used in service at Brisbane Transport for demonstration with step entry). Apart from 113 the others featured MACK badges, plug doors and also had a number of halogen down lights in the entry area. Passing a Euro 6 on the way home just now reminded me of something. Apparently there's two refueler entries on the drivers side of the Euro 6s, one of them's obviously for Diesel, but what's the other for? and what's AdBlue used for? It's how they achieve Euro 6 spec. Aha, I understand now, thank you. Does the red gauge towards the back of the right hand side have something to do with AdBlue? No. That's a coolant gauge. The Adblue level is displayed on the dash. Well, I can confirm that for the Bustech, just saw 622 at Tuggeranong about to depart on a 900, probably one of the last ones for today. So that is a yes. I just wanted to ask, which of the remaining P3s are stripped from ads and such? I was thinking of hiring one some time soon for reasons I don't want to reveal as of yet, but other than 120 (cause i was taking photos of it yesterday), which of the P3s have no ads on the door side, and appear to look like the livery has had a new paint job to look as surprisingly shiny as 120 did yesterday. I did have a look at the AOA discussions, but nothing has come up recently on P3s. Can't report on them all, but many of the Belconnen PR100.3s are ad-free. (edit) oh yeah, have they stopped rear window ads too, and is that still a thing? I'll have to find out exactly which bus it was when this happened last year, unless it's the same one, but hopefully after this morning the driver of bus 593 reported the problem with his buses bike rack and windscreen wipers - the problem where ... the handlebar of someones bike can jam the movement of the door-side windscreen wiper because it is leaning too far toward the buses window. Now that I think of it, that's another issue with the bucket racks, something I shall mention to ACTION next time I call them. The reason I say that, is because of the arm that the bucket racks use, it pulls the front wheel of a bike closer towards the front of the bus more than the arm of the yellow racks do. I've had this issue before (as I mention above), some time last year on the way home from woden on a Euro 6 bus on the weekend when it was raining. 1. 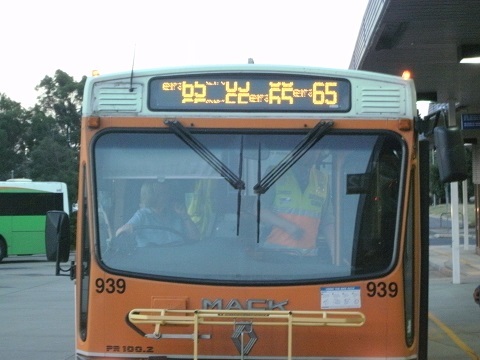 Am I right in assuming the vertically alternating NEXT and STOP is unique to bus343? 2. Buses 343 and 344 are shown in the fleet list as having the name 'Sigourney' - which one is actually Sigourney?